Books ... subscriptions ... what better presents? My most recent birthday card from my wife had a cartoon with the caption 'You can never have too many books', and inside she had written '... just too few bookcases', a comment on the fact that in the past it has sometimes been hard to get to the bookcases for the piles of books. But they are irresistible, aren't they? I have a few copies left of Henry James Sat Here, for that really quite different gift. For the Venetophile The Bricks of Venice cannot fail to please (but, if you are in North America, please note that I finally must put up the dollar price to be more realistic as from 1 January 2008 - buy now at today's price!). For a great fireside read for the armchair traveller Tonge's Travels takes some beating. These and more at our website. And here's another thought: how about giving that book lover a year's membership of the Fine Press Book Association? It brings two issues of the journal Parenthesis - 64pp packed with articles and fully illustrated, a great introduction to the world of fine printing. Details at the website or from us. And are you a member? And have you renewed for issues 13 (out real soon) and 14 (out in the Spring)? If you're not sure, click here and ask! Our latest title was sold out before it was published. On the plus side, it is sold out. On the minus side, we could have sold more copies! Oxford's Ornaments was the fifth in a line of titles around Oxford University Press (the others being The Fell Revival, Stanley Morison & 'John Fell', Harry Carter, Typographer, and Three Pieces), and a number of customers have asked (in hope?) whether it was the last. I have a suspicion it is not. Between 1893 and 1915 Horace Hart (he of Hart's Rules) was Controller of the Press, and it was he who transformed its Printing House from a somewhat sleepy affair to one of the leading printers of its day. There is much material in the archive at OUP that tells us about the changes that he made in its working practices and plant and, although, we have used some of it in (for instance) The Fell Revival, I think there is another interesting story to be told. Title? Hart's Rule of course! Stay tuned. Oxford's Ornaments may be sold out but I do have a few copies of some small ephemeral pieces related to the title: a 4pp item - Spring Cleaning at the Clarendon Press - in a black wrapper, hand-set and printed in Fell great primer, originally done for Matrix (�; a 4pp fold containing a type facsimile of a showing of the Fell ornaments from the OUP archive (�; and a 4pp fold with seven arrangements of Fell ornaments from an OUP pattern book (�. All the items are printed with original type. (P&P is � to a UK address and �elsewhere.) Click here if you would like to order or know more. Three Pieces also recently went out of print, but I find I have a few copies that were 'overs' from the binding of the de luxe edition of Harry Carter, Typographer. They are exactly the same but are out of series (ie not numbered) and have a redundant pocket in the back of the binding. I am selling these for � each (E30, US$40) plus P&P at cost. Click here if you would like to order or know more. During the research that Martyn Thomas and I did on some of our titles to do with OUP we had conversations with several people who had been involved in our areas of interest. To help us go back over what we had heard, we recorded the conversations. This has prompted the idea of making those recordings available for others to hear, and indeed of adding new recordings. The recordings are in MP3 format and with a suitable plug-in to your browser they can be comfortably streamed directly to your speakers if you have a broadband connection of 2MB/sec or more, or they will download automatically and play with something like QuickTime. The first recordings we are presenting are conversations with John Simmons, John Bowley, and Mark Arman. John Simmons was a distinguished Slavonic scholar and bibliographer. For a short period he was Librarian to the Printer at Oxford University Press, having been brought in by Printer Charles Batey to assist Stanley Morison in the research for his great work John Fell, the University press and the 'Fell' types. Simmons in turn introduced Harry Carter to the Press to work with Morison. We talked to him on two occasions, in 2001 and 2003, about those times. John Bowley was a compositor at Oxford University Press. He worked in the Oriental 'ship, the team of compositors responsible for setting texts in oriental languages. This included setting Chinese, Cyrillic, Hebrew, and Arabic. Bowley was the last of the metal compositors. I was interested in talking to him about the hand-setting done on Stanley Morison's book John Fell, the University Press and the 'Fell' types which in particular required settings of the exotic types such as Coptic and Samaritan. Our conversation ranged from the dislike the compositors had for that particular book to the management style of successive Printers. Mark Arman ran his Workshop Press in Thaxted into the mid-1990s. In his later years his sight failed and he was forced to give up printing, but with great courage he turned to technology to fill the gap. He made great use of a Mac with various added facilities to make the best use of his remaining sight and enjoyed using technology to his advantage - we think we would have been amused by the idea of making his voice available to iPod users! He died in 2006 at the age of 93 leaving, in particular, a legacy of delightful books printed and bound by hand. In these recordings he talks about two-colour printing, printing on the Farley 11 and 24 proof presses, and about the acquisition of three founts of Trump Deutsch. For the future, we are planning conversations with contemporary printers about their private/fine presses. We'll be announcing them in these newsletters in the coming months. Meanwhile, we hope you enjoy the recordings now available. We exhibited at the Modern Works on Paper fair last year: a large room had been put aside for a number of book artists and presses. We had a great time meeting an entirely new audience and made some new customers. We hope to be there again in 2008 and look forward to seeing old and new customers. 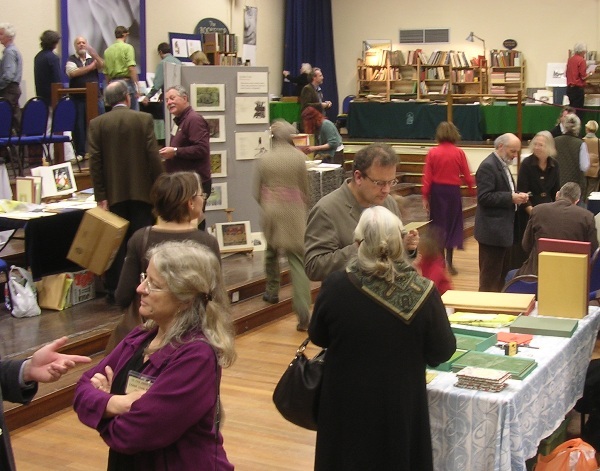 This year's Oxford Fine Press Book Fair was as ever a great occasion with sixty or so presses exhibiting as well as the trade stands and book dealers. I've put up a photo on our website taken at the end of the day - the moment when presses get a chance to talk to each other and inspect each other's work! It demonstrates that the fair is almost as much about talking as looking!